Greetings MDL Parents! We hope you are settling into the first week of summer with ease and grace and the kiddos have lots of fun and great experiences ahead! It was a disappointment that we had to cancel the end-of-the-year MDL potluck due to very unfavorable weather forecasts, but we thank Samantha Fiske for her organizing efforts all the same! The 2016–17 school year was a great one for MDL students at Glenwood Elementary; here’s a quick look back at this great year now behind us. The year started off with a bang with the announcement of a very generous unsolicited donation from the R. E. and E. F. Crane Foundation, an organization set up to further organizations focused on education, arts, and music. Added to the yearly fundraiser held just before the end of 2016, this money doubled our balance, allowing us to now have a one-year security buffer as well as to meet the teachers’ requests for books and online resources without bringing our balance down to close to the red. On one of the first chilly days of the year we met and shared dishes at the annual fall MDL potluck; special thanks Vanessa DeJongh for organizing that. On an uncommonly cold day in December, MDL students and parents marched in the Chapel Hill Holiday Parade, passing out fortune cookies and informational bookmarks. Special thanks to Alyssa Crockett for planning this and everyone who helped and attended! Also in December we held our annual MDL family and business fundraiser and exceeded our goal! This money went to Level Chinese books for the students, as well as the many incidental costs of promoting our program throughout the year and hosting our potluck community events. Thank you to everyone who donated! Visit our Sponsors page for more. 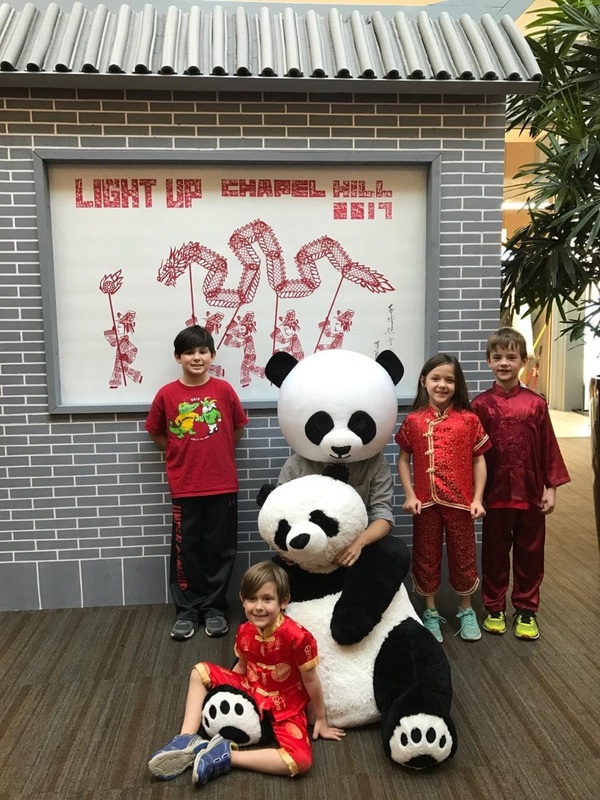 January 28 was the Chinese New Year and to usher in the year of the rooster, MDL students and parents participated with several other Chinese schools/organizations in the area in the very successful, first annual Chapel Hill LIGHTUP Lantern Festival at University Place in Chapel Hill. Parents tended a Glenwood MDL booth with information and crafts (making gorgeous little goldfish); students gave special class performances; some created special lantern designs for auction, earning us a sizeable sum; and parents and students participated in traditional Chinese dragon dance. This inaugural event was very well attended throughout the day: a great omen for many more successful LIGHTUP festivals to come! A HUGE, HUGE thanks goes to Linda Trees, our Outreach Coordinator for this tremendous effort, which took months to organize. Thanks also to all the parents who helped out, the students who performed, those who made lanterns, and everyone who attended! See the previous newsletter entry (below) for more on LIGHTUP! Right around this same time, leading up to the lottery opening for rising kindergarteners to enter MDL, we sent out an informational e-flyer to about twenty-five preschools in Durham and about thirty-five preschools in Chapel Hill and Carrboro. This was all based on the efforts of Linda Trees the year before. We also held an information session at the Chapel Hill Chinese School and a promotion on WeChat. After all these promotions, the number of applicants in the lottery this year was 69, which is well over the amount of spaces we have to fill. These events also helped increase traffic to this website, which will in turn help to improve our search result rankings little by little, so that it can become a better marketing tool as time goes on. Thanks everyone, again, who participated in these activities! Special thanks go to Vanessa DeJongh for designing bookmarks, flyers, and e-flyers for these promotions. After some concern from parents around the end of the first semester about such things as the new Standards Based assessments we were seeing on our report cards this year, Dr. Rydell Harrison and Dr. Elaine Watson-Grant from central administration agreed to meet with parents for a special MAC meeting to address our concerns. The Standards Based assessment was something that affects all CHCCS students, not just MDL students, and the conversation, after a very illuminating history and explanation of the CHCCS MDL program from Dr. Watson-Grant, focused mostly on middle school classes, their student numbers after natural attrition, and how to keep the middle school classes viable for upcoming middle school students. This is a problem that is expected to fix itself once the first of the new two-track classes gets to middle school (after two more school years), doubling the MDL student population feeding into middle school. In the meantime, we are trying to do what we can to offer Chinese to those students who will not benefit from this population increase from one track to two tracks. Parents Kari Hamel, Anna Jalowska, and Annie Xu have been meeting with administrators, and it looks like even though the numbers didn’t make it, they will still be offering some kind of Chinese learning option at Philips Middle School this coming year, the idea being that the solution found will also serve any and all middle school students who wish to continue learning Chinese in middle school during the following school year (2018–19), the last grade of students of the one-track population. It was also determined that how registration rolled out at the orientation meeting for choosing electives at Philips had significant flaws and these were brought to the attention of Dr. Harrison. This is something that will be addressed next fall, before registration next year starts in February. It was right around this time that the idea for a special MAC task force came forth. Several parents have indicated their interest in joining this new group; if you are interested, you can still join. E-mail us at GLMAC.chair@gmail.com. This task force aims to meet (at least online) over the summer to assess what general issues we are facing and how to address them. With this, we should look forward to starting the school year with a clear agenda and a course of action to implement. Lastly, we would like to thank all the MAC officers for their dedication this year. Luckily for us, Linda Trees plans to serve again next year as Outreach Coordinator, but her schedule is a lot busier than when she first created this position and she would like to have a co-coordinator or 2–3 Outreach Committee members for next year. We are very thankful for all the hard work that Diana Dolinsky has done serving her two years as MAC Secretary. This position is open for next year. Thank you very much to Kristie Mather, MAC Treasurer; we are very happy that she will be staying on to serve her second year with us next year. Anna Jalowska, whose child has graduated from Glenwood to Philips, will be serving as MAC Middle School Liaison, something that is greatly needed. I (Jack Sutherland) will be serving my second year as (native-English-speaking) MAC Co-chair next year and am very much looking forward to it. Thank you also to past co-chairs Susan Swafford and Alyssa Crockett who have generously offered their experience and insight, for which we are very grateful. And last but most certainly not least, we give a very special thank you to Helen Mu for all the hard work and dedication she has committed to our program as (Chinese-speaking) MAC Co-chair. It’s hard to imagine what these past two years would have been without her and it’s sad to see her tenure end, but we also look forward to seeing who will fill this position next year. Open MAC officer positions will be filled at the first MAC meeting of the next school year, September 13. Xīn Nián Kuài Lè – 新年快乐 – Happy New Year! On January 28, everyone around the world celebrated Chinese New Year (also known as the Lunar New Year in other countries and cultures). We said farewell to the Year of the Monkey and welcomed the advent of the Year of the Rooster. This also was the day that Chapel Hill hosted its first-ever large scale festival, called the LIGHTUP Lantern Festival, which culminated after months of meticulous planning by dozens of volunteers from the Chinese School of Chapel Hill (CSCH) and others in the community, including the teachers, students, and families of the MDL Program at Glenwood Elementary School. The festival occupied the entire common area of University Place mall and offered all-day performances, free hands-on activities, and games for the children; a dragon dance competition; lantern painting and a silent auction; a lantern parade; and, of course, Chinese food from seven area restaurants. The Glenwood MDL program was a major participant at the festival and even brought home some prizes from the competitions. Our team of volunteers included roughly 35 parents and more than 200 students (a few of whom were Glenwood graduates). 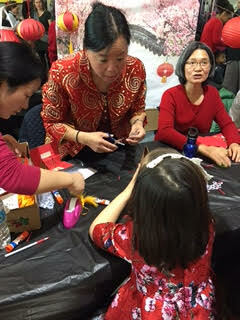 We hosted a booth that offered visitors the chance to make a lucky goldfish ornament, which was immensely popular. Visitors came nonstop throughout the day, making nearly 200 ornaments in total. All of the students from kindergarten through fifth grade performed on stage with their classes, dressed in traditional Chinese clothes and singing songs or putting on a fashion show. More than fifty of our brave parents and students formed four dragon dance teams for the competition, and one of the teams from the 4th and 5th grade made us very proud by bringing home the prize for second place in their category. A handful of parents and children also painted and decorated nine lanterns for the silent auction, four of which were the top earning lanterns at the auction. The proceeds from the lanterns totaled $510, which the MDL program has donated to Glenwood’s PTA. All in all, the festival was a huge success and surpassed everyone’s expectations. The organizers were expecting about 5,000 visitors for the festival, but they estimate that twice that many actually came. 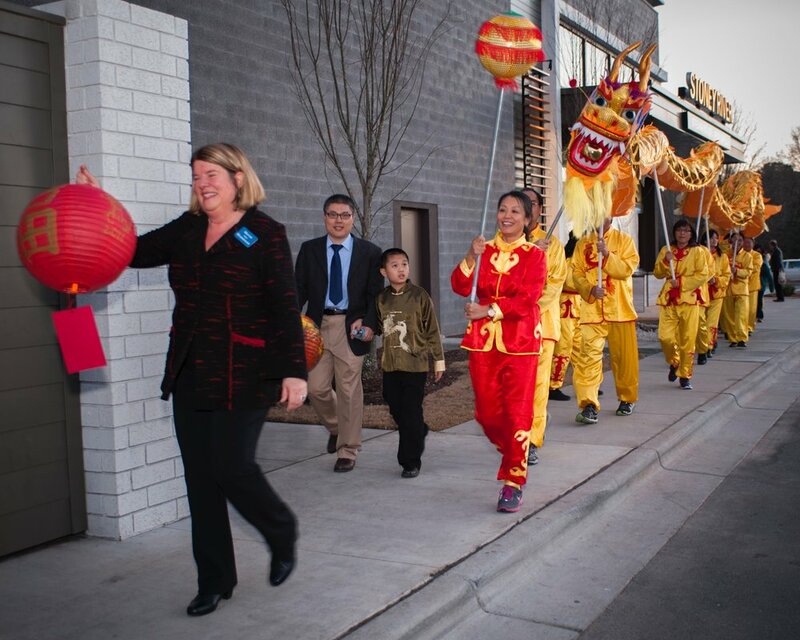 In addition to the enormous efforts of the CSCH and volunteers from the Chinese community, the festival received tremendous support and sponsorship from the Chapel Hill town leadership, particularly Mayor Pam Helminger, as well as local organizations, commercial entities large and small, and even the WCHL radio station. No doubt, their support contributed to the success of the festival as well. For more information and photos from the event, visit our Facebook page or read our article in Carolina Parent. Submitted by Linda Trees, parent of a first-grader in the Mandarin Dual Language Program at Glenwood Elementary School in Chapel Hill. Linda also serves on the Outreach Committee of the Glenwood Mandarin Advisory Council. Photos above, and some below, courtesy Barbara Tyroler. Click for more of her LIGHTUP photos. To book an event or family portrait session, go to www.barbaratyroler.com. Thanks to the many parents for their photos and videos below. 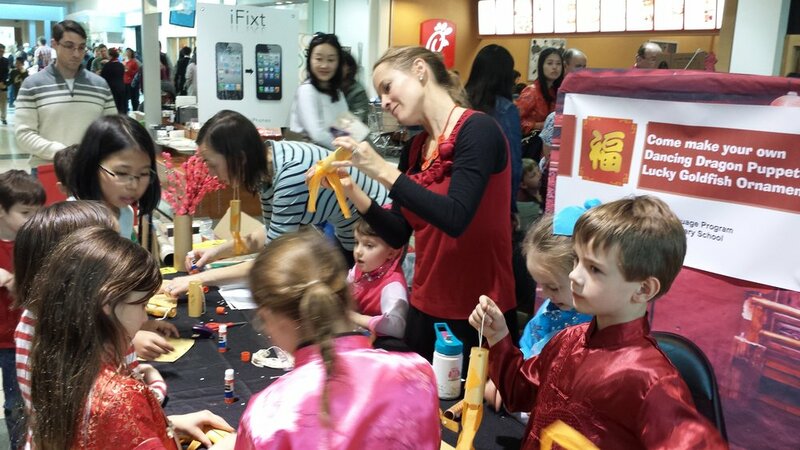 The Chinese Culture Night Fundraiser was a huge success! The total amount raised was $2,889.50. This money was used for MAC book purchases for MDL classroom use. We would like to thank business and individual sponsors for their generous donations, teachers who organized the performance and enrich the program, close to 30 volunteers who helped with the event, and the wonderful continued support and participation of our families. We also had a good turnout for the open house. Lincoln Center indicated that there was more interest than spots for the incoming K classes this year. Great job for the MAC outreach committee! Using part of the money that we raised last year and this year, MAC was able to purchase 126 books/book series for the MDL program at Glenwood. We spend $3,214.35 to purchase about 1/3 of all the books on teachers' wish lists. The books have been delivered to the teachers; and we hope the teachers and students enjoy them. We will continue to fundraise in future events in order to fund all the books needed. MDL parent and MAC social activity committee member LaDonna Huseman is organizing an end of year Picnic on Sunday, June 5, 2016 from 4:00pm-7:00pm at Hargraves Center Park Picnic Shelter, 216 N. Roberson St. Chapel Hill. Please look out for an e-mail from MAC for flyer and sign-up sheet, and please come and join us for some end of year relaxation and fun! Visit our sponsors page to see which local businesses contribute to our program. Support those who support us! Donations to the MAC (The Mandarin program advisory committee) can be made to "Glenwood Elementary PTA" with a note "for MAC"
The tax number is 56-1196269 and the PTA is a 501 (c) (3) non-profit. 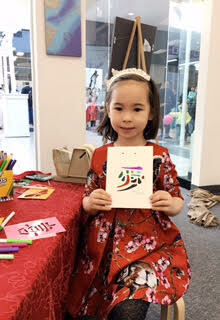 Your child can begin learning to speak, read, and write in Mandarin in kindergarten!